Looking for that special Vintage gift for him? As spring arrives in Oshkosh, we are cleaning out out inventory in preparation for AirVenture 2013. 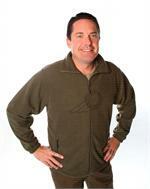 One of the best bargains in the VAA Online Store is our Fleece Jacket shown here. Available in Small through 2X. Click the image to order or to view other clothing items.